Wow – Potato Salad! Who hasn’t eaten this type of salad before? So why add it to the German Files?? Because in Germany they do it slightly differently – that’s why. Potato Salad in Germany appears at every party, gathering, picnics or BBQ and in Berlin, the traditional Christmas Eve supper is Sausages with Potato Salad (to give the housewife time to prepare for the big feast the next day). 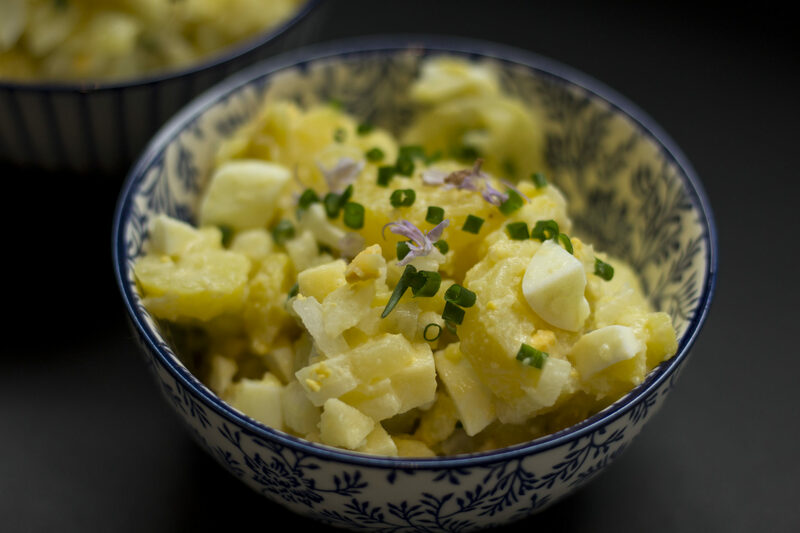 So, what makes German Potato Salad so special you may ask? The addition of gherkins and apples – yes, you heard correctly: Apples. You might find different recipes in Germany, depending on the area but these German File posts are all about my childhood dishes and hence I am writing down the recipe as my mum, nan and I have always done it (don’t mess with a good thing). I always steam my potatoes in their skin (unless I am steaming them for mashed potatoes) and for potato salad, I always use baby potatoes – they work perfectly for the salad. I peel them but you can leave the skin on if you are using baby potatoes. As for the apples, I always use red-skinned ones as I prefer the texture. The addition of apple might sound weird but trust me, it works fantastically. It doesn’t last very long and is best eaten on the day it is made, latest the next day (it’s perfect for a lunch box). In a bowl combine the potatoes, eggs, onion, gherkins and apples (while mixing it, be careful as you don’t want the potatoes breaking up too much). Add enough salad cream to coat the mix – the amount is down to your preference. You don’t want to drown the salad in salad cream! Add the fresh chives and seasoning (I only add a bit of salt – don’t like pepper very much). Note: You could add a handful of steamed peas for added colour – the sweetness of the peas goes nicely with the salad.